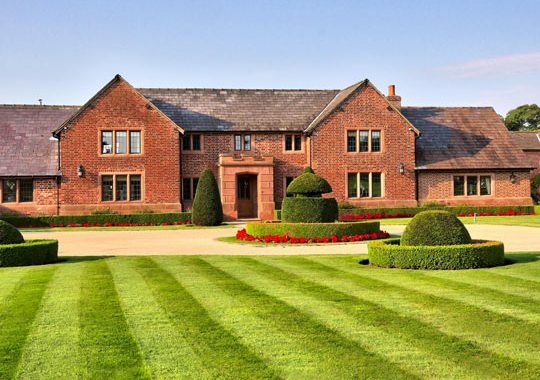 One of Merrydale’s best features is the immaculately presented Manor House which comes into view in the distance, as you enter the estate and drive down the sweeping driveway. 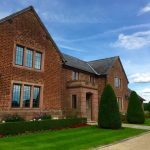 The Manor house is a wonderful opportunity for the brides and grooms to enjoy for themselves during the afternoon and overnight on their wedding day. 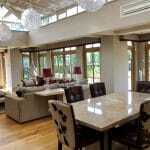 It also provides further accommodation for brides and grooms closest friends and family. The Manor house is yours exclusively so you can allocate the bedrooms to who you wish; we guarantee your guests will be fighting over these simply stunning rooms! 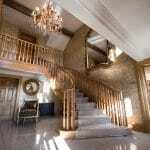 You are presented with a magical entrance as soon as you enter the front door of the Manor. 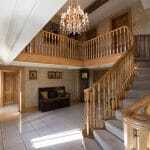 A stunning chandelier is accentuated by the high ceilings and an imposing staircase into the hallway. This particular hallway is becoming a photographers dream location for getting those special shots of the bride, father of the bride and bridesmaids before the ceremony itself. To the left of the hallway, you walk straight into an open plan sizeable kitchen and a social living area which then flows into a modern and elegant Orangery. The Orangery is surrounded by the Merrydale gardens and is a perfect spot for reflecting on the day. To the right of the hallway, there is a study area and luxurious lounge. These rooms are dedicated for guests to use at their leisure and relax in whenever they desire. At the top of the staircase, you are presented with four luxury double bedrooms that the bride and groom can choose to allocate to their guests. 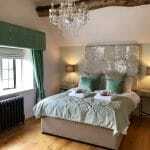 Each room includes an en-suite bathroom and is based around a seasonal theme, Spring, Summer, Autumn and Winter. Spring. This room includes a beautiful view to the front of the Merrydale estate and a spacious dressing area as well as en-suite. This room features a beautiful turquoise interior, emanating a relaxing and tranquil feel. Summer. With its warm and inviting mauve interior and a quirky Zebra themed en-suite bathroom, this room is stylish and exquisite. As with all the bedrooms, the bed is king-sized and oozes comfort. Autumn. This is a particularly lovely room and most couples choose this as their bridal suite (if they choose to stay in the house). The room features a rich, burgundy interior throughout and has the most spacious en-suite. There is a luxurious dressing room area which is the ultimate getting-ready space for the bride and her bridal party so you can really make the most of the venue from the start of the day right until your head hits the pillow. Winter. The final room is the first room at the top of the staircase. This room has a small dressing table space for wedding prep and an extremely spacious en-suite bathroom. 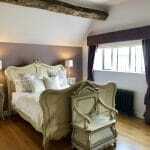 The bedroom itself includes a black wrought iron four poster bed and features crisp, sky blue walls. This room includes double doors leading straight onto a balcony in order for guests to make the most of the spectacular views of Merrydale’s immaculate gardens and beyond. If you make your way back down the staircase and through the comfortable lounge, you will arrive at a beautiful, gallery hallway which takes you away from the Manor house and leads you to the second of our feature staircases. Another favourite spot for photographers with even more stunning views of the grounds. At the end of this hallway you have the makeup room to your right and at the top of the stairs another bridal suite which forms part of the Courtyard rooms, so there are plenty of options for you to choose from at Merrydale Manor. Once you’ve enjoyed your wedding day, taken your vows and danced the night away, what could be better than resting your head in the Manor. You can then wake and share a Full English or continental breakfast in the morning with your family and friends. 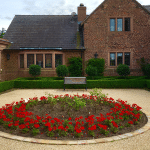 Staying in the Manor House really is the icing on the cake for any bride and groom and being able to tie the knot, celebrate and stay the night in one location is one of the reasons why we are one of the most sought-after Cheshire Wedding Venues. 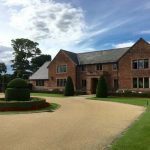 If you want to learn more about our Manor House then please don’t hesitate to send an email to [email protected] or give our office a call on 01565 724060.